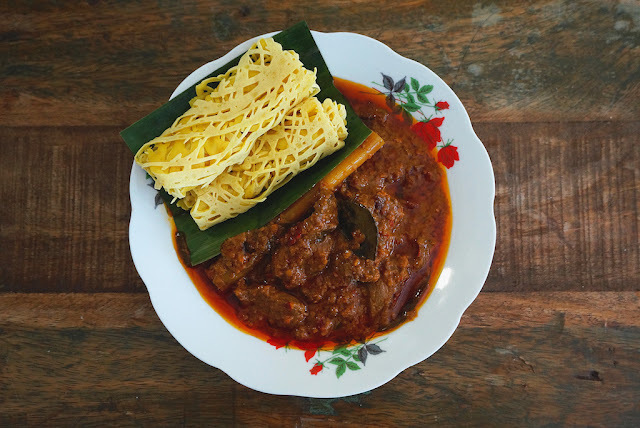 Beef Rendang is a popular dish in Indonesia, Malaysia, and Singapore. It is usually eaten with glutinous rice cooked in coconut milk, Roti Jala or just with some steamed rice. Combine the spice paste and blend until fine. Kerisik: Dry fry the grated coconut on low heat until golden brown. Let it cool slightly, transfer it to a pestle and mortar. Grind and pound the coconut until very fine and the oil separates from coconut. Heat about half cup of peanut oil in a wok over medium heat. When the oil is hot, add the blended spices. Stir fry until fragrant and the oil separates from the spices. Add the lemongrass and beef slices. Stir and mix well with the spices. Then add coconut milk and a bit of water, if desired. Mix well, add asam keping and bring the mixture to boil. Cover and lower heat and simmer for 1 hour. Then add kaffir lime leaves, turmeric leaves, and season with some palm sugar and sea salt. Continue to cook for another 10 to 15 minutes or until the sauce is thicken. Serve warm. Note: Once the Beef Rendang is ready, let it rest for awhile, then remove the excess oil before serving.